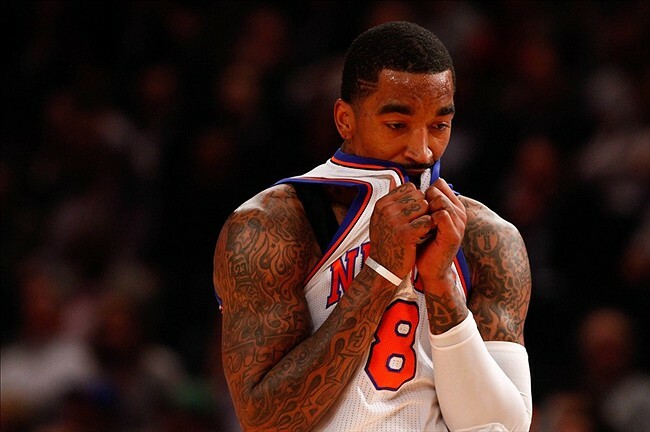 League sources revealed Thursday that Knicks sixth man J.R. Smith played through a knee injury during the postseason. Smith had fluid on his knee, which is the same ailment Carmelo Anthony suffered from in March. Anthony’s game was severely impacted by this injury, and it seems to have had a similar effect on Smith, who struggled mightily in the playoffs. Smith reportedly began complaining of the injury during the first-round series against the Celtics, in which he played well in the first couple games before getting ejected and suspended for elbowing Jason Terry, after which he was not the same for the rest of the postseason. Anthony’s problems went away immediately after he got his knee drained. Smith is considering getting the same procedure. It is hard to imagine why he did not do this earlier (especially during his suspension), and it is hard to imagine that he will be foolish enough to decline to get the knee drained now, with the Knicks facing a 5-month layoff. This entry was posted in Articles and tagged JR Smith, jr smith bad, jr smith clubbing, jr smith good, jr smith injury, jr smith playoffs, KNICKS, knicks injury report, KNICKS MEMES, Knicks news, new york knicks on May 23, 2013 by Tommy Rothman.